Goals and intentions for the class – what do you hope to accomplish? What do you hope to get out of this experience? How do you plan to work? Goals and intentions for your blog – similar, but just for the blog. Excitement/apprehension – what are you excited about regarding this class? What are you apprehensive about? Blog recommendations – are you already reading blogs that are relevant to class topics? If so, write one or more blog posts and recommend those blogs to classmates. Explain what is the focus of the blog, and what kinds of information we can find there. 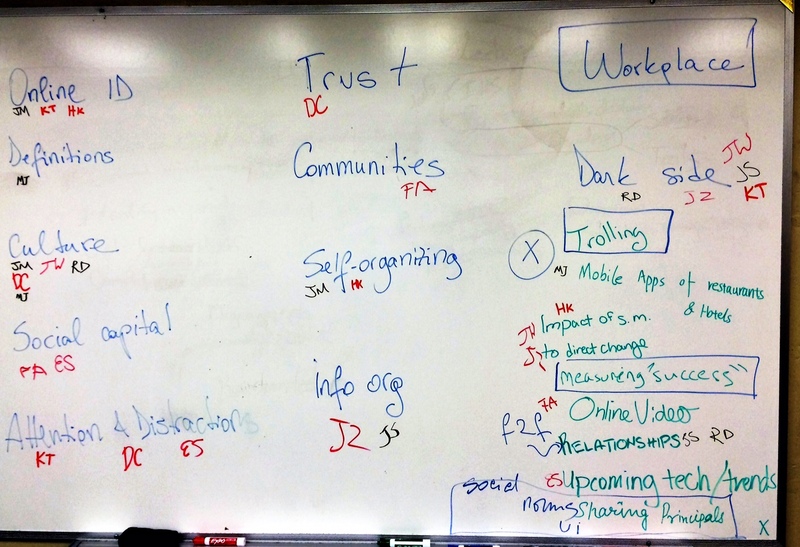 We’ll spend the next 2 weeks of the semester (Feb 1 and Feb 7) exploring research directions related to social media. Those two classes will be good times to start your Research Article Analyses (RAAs). Remember (or see the syllabus) that you have to read and analyze 5 research articles about social media, in the context of your own interest. Each article analysis is worth 5 points, for a total of 25. First, identify a list of 5-7 articles you are interested in reading. Make sure they are research articles – published in academic research journals. Make sure they include some aspect of social media, as well as your own area of interest. Personally, I like using Google Scholar to identify articles, then find the full text through Purdue libraries. You can also browse the bibliographies danah boyd maintains about SNSs and twitter/microblogging. Keep in mind that your list may change over the course of the semester, and that’s OK. If you want to, publish it in a blog post. Second, here’s what I’d like you to do for Feb 1 and Feb 7. Read one of your selected articles for each class, and write the article analysis following the structure recommended below. Be prepared to talk about your article during class discussion. The more diverse the body of articles we talk about, the more aware we will become about research directions. Third: After Feb 1 and Feb 7, you will choose when you want to do your RAAs. Take a look at the topics listed on the syllabus. If you know you are interested in, say, community building and online communities, then you may want to review an article and bring it up during that week’s class discussion. Make sure you blog about it, following the same structure recommended below. It is your responsibility to make sure that you have read and analyzed 5 articles before the end of the semester. You cannot cram 2 articles during one week, and certainly do not leave this for the end of the semester. Full article citation in APA style, linked to full text if full text is available online. Purpose of the research: Explain what the authors set out to accomplish. Methods: Explain, very briefly, what methods the authors used to accomplish the research goal. Analysis: Write your own thoughts about the article. You, could, for example, address some of the following: What does this article mean to you, is it useful or not for your research interests and current/future projects? What are the main things you wish to remember about this article? What are some of the limitations of the article? What directions for future research does this article suggest to you? Etc. In addition to writing these, make sure you read your classmates’ article analyses. This way, you’ll be exposed to more information about social media research. Make sure you bring up the article(s) you read during class discussion. Be prepared to summarize, explain the article, answer questions about it. b. PR examples – whenever you identify examples of PR, write about them on your blog. Describe what happened, and evaluate it: Was it good or bad PR? Why? Provide links to relevant material and related online conversations. See how PR student Erin Sanders did it last semester.